The National Seal Sanctuary in Cornwall is bidding for important funding from Europe to help it continue its work. The sanctuary was established in 1958 and is a lifeline to hundreds of seals and pups washed up along South West coasts. In recent months, its work expanded to help care for seals affected by the recent outbreak of Phocine Distemper Virus (PDV). The centre says despite the outbreak being over, it is still being pushed to its limits and is bidding for extra funding from the European Regional Development Fund. The seal sanctuary moved to its current premises in Gweek in 1975. It is a busy rescue centre and has resident Grey Seals, Californian and Patagonian Sea Lions, goats, donkeys, ponies and otters. The RSPCA said on Thursday an outbreak of PDV which killed hundreds of seals has come to an end. PDV is a morbillivirus, of the same family as measles, and related to canine distemper. It attacks the white blood cells, which become more susceptible to chance infections. 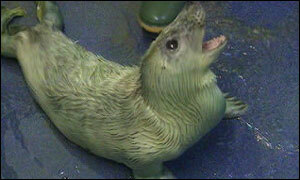 About 1,500 seals died from the virus in 2002, estimated to be about half the population on the east coast of England. Experts from the Zoological Society of London, which has been monitoring the PDV outbreak, said it could take 10 years for populations to recover. The outbreak began in Scandinavia last spring and reached the coastlines of Norfolk and Lincolnshire in the summer.